This RSA facility is open only for Poolers with vehicle in Delhi NCR, Mumbai, Pune, Bangalore & Jaipur. User’s Account details should be updated with current address, phone number & all fields. DL No. & Car Registration No. should be clearly seen in photo & all details have to be clearly spelt in vehicle details. This complementary RSA coverage is renewable monthly. To keep the coverage continuous, Carpoolers have to complete at least 6 rides with a Rider every month. 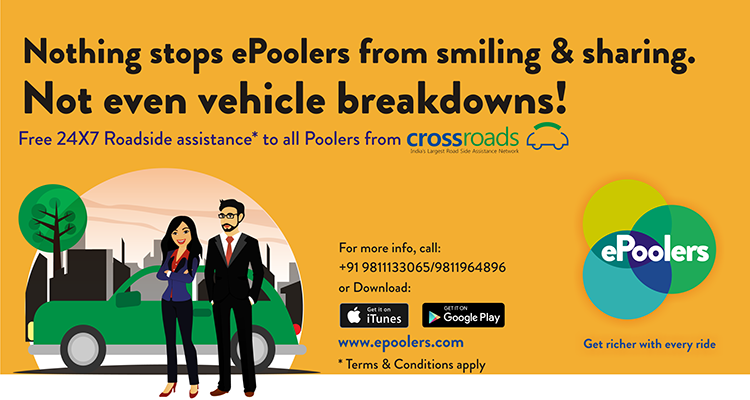 To keep the coverage continuous, Bikepoolers have to complete at least 15 rides with a Rider every month. Every vehicle can avail this RSA facility once a month. User will get the e-card of Crossroads RSA in their inbox. No physical cards will be provided by ePoolers or Crossroads under this scheme. In case of distress, user should call the helpline no. 011-47090909 or 1800 419 0199 for prompt service. Customer can avail any one service every month from below mentioned list of services for each membership. This membership is valid for service within Delhi NCR, Mumbai, Pune, Bangalore & Jaipur.